I've done a little searching and haven't found much on this problem. I have an i5 2500 and have been using an ARCTIC COOLING Freezer 7 Pro Rev.2 aftermarket cpu cooler. I've applied Artic Silver 5 (proper amount, only enough to make contact). I have applied thermal paste quite a few times and its worked great. When folding (slightly less intense than running prime95), my processor goes up to about 79-81c. Which seems fairly high for an aftermarket cooler. I have a fan at the bottom front pulling air in and a fan at the top of the case as an exhaust. The normal top back fan was removed so that the heatsink could fit. This is a standard mid tower case, so the air flow should be fairly good. Not perfect, but I don't fully understand why the processor is hitting high 70's to low 80's. Maybe the Freezer 7 Pro is not really much better than stock? Note: when idle (excluding folding with one nvidia gpu), the processor seems to sit at about 35-36c which seems okay. Note: I tried stock with the pre applied paste and it appeared to be way too much paste. The temperatures quickly rose to 80 before I stopped the processor from heating up anymore. The freezer 7 pro cooler did reach at about 80 and sat there, but at about 70+ it slowed and it took a few minutes to reach 80. Re: High i5 2500 temperatures? Sounds about right considering how you said you have your case setup. What are the ambient temperatures where you have the PC located? I'm not sure how to keep track of ambient. I've used hwmonitor in the past and used the program speccy to get the current cpu temperature. Is there a good freeware utility for ambient temperatures? My advice is to use a thermometer. Ambient temperature is the temperature of the room you have the computer in. Ah, I thought you meant the temperature within the case. The room is often 18c, its the living room and is never hot or cold. I'm guessing that the heatsink should produce a better temperature, so it maybe up to the fans inside the case. Right now the heatsink is placed in the upper back part of the case blowing air to the upper front of the case. 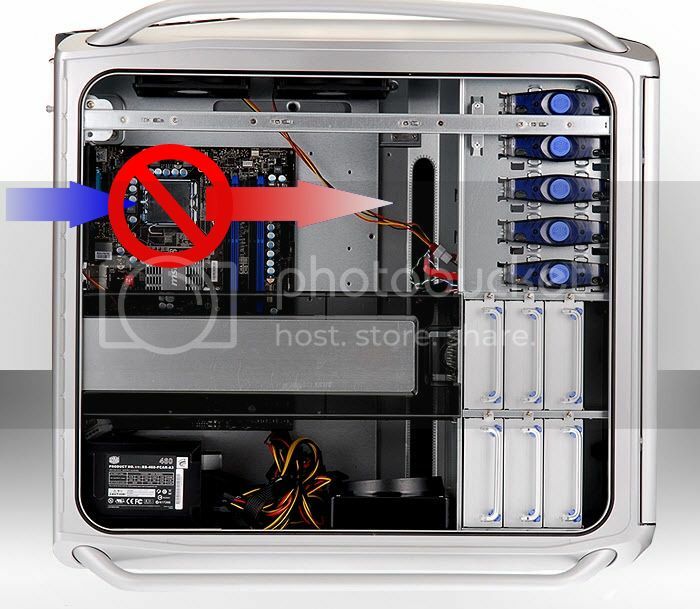 There is a fan on the top of case pulling air out (but its in the upper center part of the case). You don't want to do that. That's probably why the temps are higher than they should be. You always want to have the CPU fan pushing air out toward the back or top of the case. This isn't my case, I grabbed this image off of Google images to use as an illustration. The reason why I placed it in an improper way was because the intel board i'm using (for some reason), has the ram slots directly beside the CPU. So when I reverse the heatsink direction, the fan collides with the ram. The only way for the heatsink to work is to have the fan (thats part of the heatsink), raised about 20-30%. 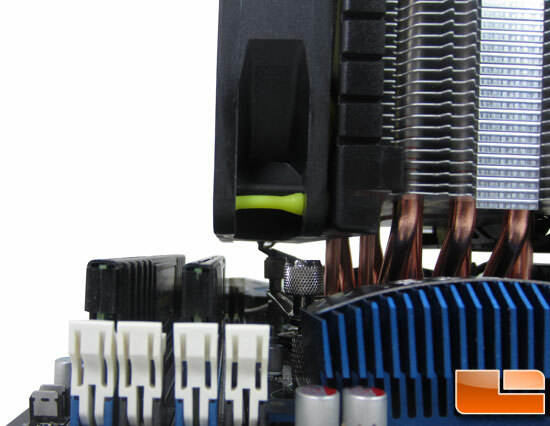 This will cause the heatsinks fan to hover slightly above the ram while 70-80% of the fan cools the heatsink. However with the temps i'm getting, i may just try that. The only alternatives I have now if this all doesn't work is go back to the stock heat sink (which has a fan that shoots air straight up from the board) so it won't overlap the upper back case fan or the ram. Potentially trying to find another compact aftermarket cooler (that is similar in design to the stock version) but more effective. Here's hoping. Option C should be feasible for you. What is your case? what is your motherboard? The case I bought a long time ago and can't seem to figure out what it is. Its a smaller mid tower case known as Thermaltake Black edition V1 (from what I remember), a cheap case that was about 40$ cdn. I've been tinkering with this setup for last few days after work (been working a lot) so common sense as eluded me. I've flipped the bracket 90 degrees so that the fan would aim upwards (which works worlds better with an open top case). I'm running prime95 (with in place large fft's, maximum power/temp test) the temperatures are sitting at about 61-63c. The board is ASRock H61M-VS. MicroATX Board that works within a normal sized mid tower case, however the components are very close together. The heatsink with the vertical orientation almost touches on 3 sides. The fins almost touch the ram and the other side almost touches the upper back case fan. The heatsink fan almost touches the video card. However there's a few mm of space around the heatsink and so far its working out. Thank you guys for the help, sorry for the idiocy on my part. If you feel comfortable doing it try updating your BIOS. Seems like they might have addressed some of the temp issues. ndimario wrote: The case I bought a long time ago and can't seem to figure out what it is. Its a smaller mid tower case known as Thermaltake Black edition V1 (from what I remember), a cheap case that was about 40$ cdn. I've been tinkering with this setup for last few days after work (been working a lot) so common sense as eluded me. I've flipped the bracket 90 degrees so that the fan would aim upwards (which works worlds better with an open top case). I'm running prime95 (with in place large fft's, maximum power/temp test) the temperatures are sitting at about 61-63c. Was going to suggest turning it so the fan was on top. 61-63*C is a good load temp. Depending on what thermal paste you are using you may get that lower by a couple degrees. At this point you may not want to tear the system apart again. The temps you are getting now are fine. With the size of coolers anymore this is an issue lot of users face. So welcome to the learning curve, so for your next build/upgrade you will now have a couple more tid-bits of gotchas to look out for. and the only truly stupid question is the one you don't ask.